I’ve never cared for “Best” lists. Their subjectivity is beyond the pale. To declare something the “best” is to imply I’ve experienced everything else in comparison. That couldn’t possibly be less true. With that in mind, I still needed a way to recap some of the amazing music I’ve experienced in 2018, without declaring anything the best. So why not keep it simple and refer to these five releases as Favorites. Whether or not they are the best Music had to offer is completely up to the listener. There were any number of memorable releases brought forth this year, including live sets from Steven Wilson and King Crimson, and archival brilliance from John Coltrane as well as Trane with Miles Davis. There was also a posthumous release from Prince, and new efforts from any number of talented artists, all of which got a little time on my CD player. With that being said, here are the five releases that really stood out for me in 2018. 5. The Beatles, The Beatles (50th Anniversary Box Set): After the triumph of the Sgt. Pepper’s Lonely Hearts Club Band remix of 2017, my sister and I wondered aloud if such a treatment could be given to The Beatles, aka “The White Album,” a release she and I have really enjoyed over the years. Well, ask and ye shall receive. Thanks to the talented ear of Giles Martin (son of legendary producer Sir George), The White Album got the 50th anniversary treatment it richly deserved. The seven-disc set (which includes one blu-ray disc) contains mono, 5.1, and new stereo mixes put together by the younger Martin, and they sound positively brilliant! 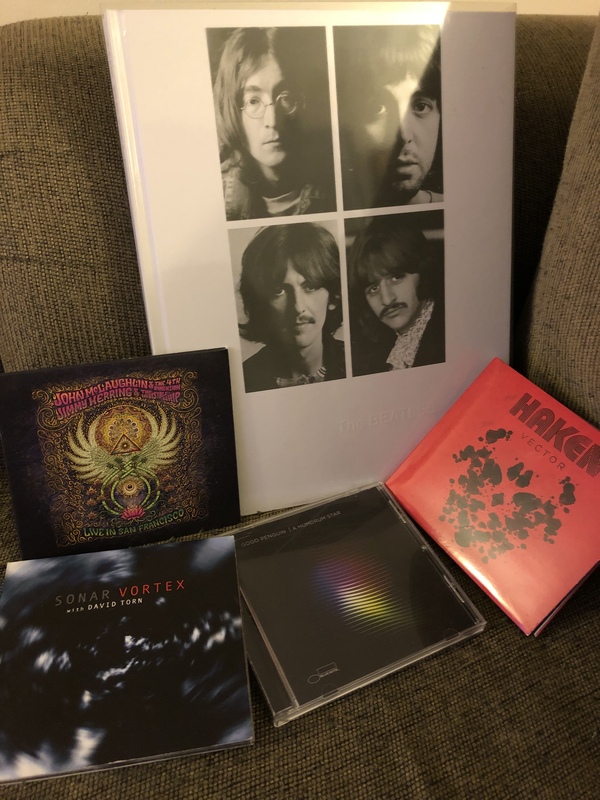 Also included are the legendary Esher Demos (the sketches that led to the initial recordings) and three discs worth of session recordings, documenting the White Album’s assembly. How cool is it to hear John, Paul, George, and Ringo do their work like we’re in the studio with them, directing, stumbling, and joking their way to their next brilliant release. The full box set is not cheap, but it is most certainly worth it. I can only hope Abbey Road and/or Let it Be is destined for similar treatment. 4. John McLaughlin and the 4th Dimension with Jimmy Herring and the Invisible Whip, Live in San Francisco: In 2017, I made my way from St. Louis to Nashville to catch John McLaughlin’s farewell tour. The man and his band, the 4th Dimension, were a sight to see. This could also be said for guitarist Jimmy Herring and his band, The Invisible Whip, who opened the show. Each band played a set, and then the two groups combined for a third set as the new Mahavishnu Orchestra, the group McLaughlin made famous in the 1970s. That combination is the content of this disc, recorded on the band’s final U.S. stop, at the Warfield Theater in San Francisco. Hearing the sound of those musicians tackle classic tunes like Meeting of the Spirits,” “Birds of Fire,” and “The Dance of the Maya,” among others, sent a flood of great memories through my mind. McLaughlin defied us to believe he is 75 years old, playing like a man half that age, or younger. I remember seeing the looks of awe coming from Herring and the other musicians when McLaughlin blazed away, leaving everyone else in his wake. This CD helps to solidify those memories. 3. Haken, Vector: I’m relatively new to this band, and was still recovering from a couple of their studio albums and the extraordinary L-1VE release when I heard a new studio album was coming. Vector dropped just before I caught the band in concert (an experience I’ll get into another time). The sound is denser and darker, but still laden with air-tight riffs and soaring vocals the band is well known for. How the band keeps that much music in its mind is beyond me. This is the sound of a remarkably strong band that hasn’t reached its peak yet. One can only wonder what will happen from this point forward. 2. GoGo Penguin, A Humdrum Star: While the post-bop form of Jazz will forever resonate in my heart, I’ve been eager to hear newer, younger bands push the art form into the 21st century. Christian Scott and Kneebody have added interesting American aspects to the classic art form. But the most interesting sounds have been coming from England in the form of GoGo Penguin. Their latest album, A Humdrum Star, continues to improve on the formula of piano, bass, and drums playing jazz, but with modern elements like electronica and trip-hop. What’s interesting is that these elements are often played by the band without the use of actual electronic devices. It’s all in the hands. Listeners will find it remarkable just how much space can be occupied by just three instruments. I haven’t been able to get enough of this sound. 1 Sonar with David Torn, Vortex: I knew this project was coming for several months, and I don’t think I’ve anticipated anything more. I fell in love with the interlocking tri-tones of Sonar courtesy of their album Black Light. Now things were being taken to the next level with the addition of soundscape guitarist David Torn, who doubled as the album’s producer. The airtight sound of Sonar’s interwoven guitar, bass, and drums coupled with Torn’s loops and sonic manipulations (as he calls them) make for a perfect musical union, both highly disciplined and completely over the top. What I would have given to trade places with my friend and music journalist Anil Prasad, who oversaw the proceedings in Switzerland. This is some of the most innovative music around, worthy of intense study, and will never get old. I may have to break my promise and declare Vortex the best album of the year. There are plenty of other lists out there, but this one is mine. I hope you find it of use. There was lots of music released in 2018. Feel free to share with me those you feel are worthy of discussion. Here’s to an equally sonically pleasing 2019! I remain unconvinced about The White Album and I’m no fan of Haken’s but the other three albums you’ve selected here fully deserve to be singled out for special attention in my opinion.